To write their equally fascinating and practical new book, New Power: How Power Works in the 21st Century—and How You Can Make it Work for You, Henry Timms, the President of the 92nd Street Y, a major cultural and community institution in New York, and Jeremy Heimans, the CEO of Purpose, a company that builds social movements all over the world, joined forces to come up with a guide to navigating the world of crowds and chaos and connections we all live in. They spent three years talking to practitioners, academics and researchers on the cutting edge of what they call new power, which flows from what they think of as the essential skill of the 21st century: the ability to harness the energy of the connected crowd. Their research and conversations took place all around the world and included everyone from the heads of intelligence agencies in Washington to frontline health workers in the Netherlands. They write about the battle and balance between old power to new power, and show how they’re fueling the defining transformation of our times. But like all fast-moving trends, sometimes it’s hard to see it clearly when we’re right in the middle of it, which makes New Power just that much more important. It’s a guide to spreading ideas, launching movements, raising money and much more. It was my pleasure to talk with Henry about what he and Heimans have learned about how power structures are changing, how people can get started making the shift from old to new power, how the principles of new power are related to the principles of lean startup, and the responsibilities that come with all the amazing energy being channeled. It’s also my pleasure to offer three copies of New Power to readers, thanks to Henry and Jeremy’s generosity. Tweet your thoughts on our conversation with the hashtag #newpower and I’ll choose three winners at random on April 12th. Let’s start with the basics. 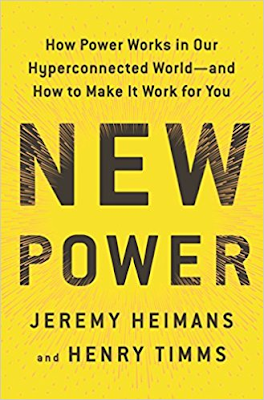 What’s the difference between old power and new power, and how did you and Jeremy get interested in defining them? Jeremy and I came at the world from very different places. He’s an activist and movement-builder and launched movements like Avaaz and Get Up! and I run a 143-year old institution. But we were both trying to get our heads around what was really changing in the world. And so often, the conversations about how the world was changing were reduced to quite a shallow discussion about technology--it was all something to do with Twitter, or changing tools. But it wasn't really a conversation about power. We both in our work started to ask, "What's the right taxonomy to think about all of these changes in the world?" and we galvanized around old power and new power. The old power world is the one we know well, which is very command and control, top-driven, managerial and based on downloading information onto the world. What's emerging is the new power world, which is much more about things that are made by participation, about upload, and about distribution models. New power--that ability to harness the energy of the connected crowd--has really become the essential skill of the 21st century. If you look at all the people who are coming up on top right now, for good and for bad, what they have in common is the capacity to capture that energy. So whether we look at Trump and Obama and the unexpected victories that they both had politically, or we look at platforms like Uber or Facebook, or we look at movements like #metoo or March For Our Lives, these very different examples all share one thing: the people who are leading them have worked out how to harness this power of the crowd. Was there a moment in your own life and work when you first saw the effects of new power? The 92nd Street Y is in New York, where one of the events we all pay attention to is UN Week. UN Week is typically the most old power week of the year. The only people who get anywhere near the action are people who have a UN Grounds Pass or who can afford to go to the Clinton Global Initiative. You had the most exciting people in the world here talking about the biggest issues of the day, and it essentially excluded most people. You couldn't get anywhere near it. Really, what UN Week brought New York was gridlock. So about eight years ago, we at the 92nd Street Y – along with Mashable, UNDP and the UN Foundation – created the Social Good Summit which I think of as something that looks at the world through a new power lens. We said, "Instead of this being top-down-leader-driven week, how do you get people engaging in these issues in much more connected ways?" We opened up to thousands of bloggers and social entrepreneurs and others to come be part of it at the Y here. Then we encouraged people to meet up and create their own events around the world. We had meetings that first year in twenty-five countries where people collectively organized their own events similar to the Social Good Summit. Now we’ve counted 100 satellite events around the world. I’m speaking this summer at the Social Good Brazil event – which is larger than ours in New York City. Can you tell me a bit more about your own experiences transforming an old power institution into a new power role model? The 92nd Street Y is all about strengthening community. In the old power world, the way we did that is people would come through our door and we'd offer them experiences. For years we've created programs and people would pick up the catalog and consume our programs. But all the new tools available now allow us to do that work in a very different way. #GivingTuesday is a perfect example of that. We took one of the key values of the Y, which is around community and philanthropy and said, "After Black Friday and Cyber Monday, how could you create a day that was really about philanthropy? How would you create something that could really scale around the world?" And that was #GivingTuesday. The design of Giving Tuesday was very new power in a couple of ways. First, we never branded it. We never called it the 92nd Street Y’s Giving Tuesday, and the goal was never that it would be all about us. It was built so that other people would grab it and make it their own. Second, we designed it so people would improve it. As a result, Giving Tuesday has morphed into all sorts of different hashtags and different campaigns around the world. I remember very early on when Baltimore turned Giving Tuesday into BMore Gives More--Baltimore Gives More. They decided they were going to make it all about how generous Baltimore is. Then the organization Dress for Success, which takes donations of clothing for women getting back into the workforce, turned Giving Tuesday into Giving Shoes Day, which was about women giving professional-appropriate shoes to those going back to the office. University of Michigan turned Giving Tuesday into Giving Blueday, and they used it to raise $5.5 million last year. In the old power model, we'd say, "Cease and desist.” You've changed our brand, you've altered the frame. But in the new power world these are all signs that your idea is spreading in the right way. At the 92nd Street Y when we’re thinking about the future, we aren’t just thinking about new technology, but new models for building stronger communities. How did you decide to expand your original Harvard Business Review piece on new power into a book and what the research process was like? When we did the HBR piece, we started hearing from people around the world who had taken it and worked out ways of using it for their own needs. One of the best examples is a group of health workers and nurses in the National Health Service in the UK who built on the ideas in the HBR piece and made a curriculum for their own work. We kept hearing, time and again, from so many different sectors that the old power/new power frame was speaking to them and to the challenges and options that they faced. Even spies, who are perhaps the ultimate old power sector, started to engage with the idea, realizing now that they're going to have to work out how to deal with a much broader and engaged and connected landscape if they want to succeed. So even intelligence agencies are experimenting around open innovation and open sourcing and all these things and they recognize that they can mobilize the crowd around the outcomes they want in the world. The reason we wrote the book was to really lay out this set of skills that help people become more powerful. The book offers a new playbook for a hyperconnected world. It asks and answers questions like: "How do you think about spreading ideas?" "How do you think about transforming an institution?" and "How do you think about raising money?" For that last one, of course, there’s a very new set of dynamics around things like crowdfunding, which everyone now needs to understand. The book is very much a practical guide for how people can think about their own power and how they can think about being more effective in the world. There are also some cautionary tales. I think it’s fair to say we’ve seen some of the dark side of new power lately, too. Yes, and that’s why the stakes are so high. If you agree that the essential skill of the 21st century is the ability to harness the connected crowd, you have to also agree that a lot of the people who are doing that well are not on the side of the angels. You look at the capacity of anti-vaccers to out-message health professionals. You look at the power of climate deniers to communicate better than climate scientists. You look at internet crazies who are doing better than academics who have all these truths and all these facts. There's this real surge of new power that is not ending up in the right hands. So while the first bit of the book is a practical guide how people can really get their head around this new set of tools, the second bit is a call to action--which is to say, we really need those on the side of the angels to get good at new power quickly. The voices of reason need to catch up. I think we're also seeing the beginnings of a new kind of political consciousness emerging against platforms, who have gobbled up a lot of new power and extracted it for their own ends. There seems to be a very big market opportunity for someone who could create platforms that actually create meaningful and fairer connections with the people who create the value. Who, in the course of your research, have you seen doing that most effectively? So many of the people who are good at new power think about their work in an experimental, entrepreneurial way – with some real overlap with the Lean Startup method. Rapid experimentation isn’t something that’s just entrepreneurial, it's actually what the best mobilizers do. You talk to any long-time campaigner or activist; they'll tell you that's how they think about their own work-- just constantly experimenting until you see something that hits. I think that's probably the ultimate lesson of new power. It isn't something you do once a year. It's a practice that people need to learn and get good at. In fact, you can think about the Lean Startup movement itself as an amazingly effective exercise in new power. Leaders all around the world have grabbed the central frame, made it stronger and stepped up to organize, create and collaborate. They aren’t waiting for permission. They all now connect with one-another in dynamic and productive ways, but without a top-down old power mentality. Ultimately, Lean Startup is a community. How do those two aspects--the practical and the cultural--play out in the business world? We think a lot about how many of the most powerful businesses we see now have new power models but revert to old power values. Uber's a great example; it has this amazing new power model with terrific execution. But they really resorted to old power values: secretive, very leader-driven, and very transactional in lots of ways and it, obviously, ended up costing Travis Kalanick his job. Contrast that with a company like Lyft which is trying, with some success, to actually create a business that has both a new power model and new power values. New power values are much more about empowering the crowd, about more transparency and collaboration, and engaging with the wider world. For two companies who essentially offer the same service, there is a real return available around culture and values. When Uber and Lyft were in a recent price war, at the same time that Uber was seeing its drivers organize pickets against it around the country, Lyft, essentially, responded by organizing picnics. They're really trying to build enthusiasm and community amongst their drivers. It will be interesting to see where they go with this. Facebook offers another example of a new power model with old power values. And the price of that is becoming clear. It's very much about centralizing value, it's very much about Facebook deciding what's good for the world and not the users. It's very opaque in terms of how it's governed and how the algorithms work. For businesses, we think the opportunity is for organizations to build a culture that is based on more than the efficiency of their algorithms, and fosters the human connection they have with people in their network. What’s your opening advice for someone who’s in an old power organization and wants to start making change? I think the biggest shift is not about technology, but actually about professional identity. It's about whether you are, in a committed and strategic way, really prepared to think about how you can engage more people more meaningfully in your work. For generations, the only real ask we had of our communities is "do what you're supposed to do" or "buy my product." That was kind of how the world worked. What's so interesting now is those businesses who are doing well are those who are offering more interesting routes to participation – far beyond “just consume”. Airbnb is a great example of that. They have worked out how to get their crowd to be their hosts, they've worked out how to get their crowd to fight their regulatory battles for them, they've worked out how to get their crowd to essentially be their advertising machine. Our argument is that for every business, every organization, every political activity, mobilization is now the key activity if you want to get ahead. The book offers the playbook for the new power world.